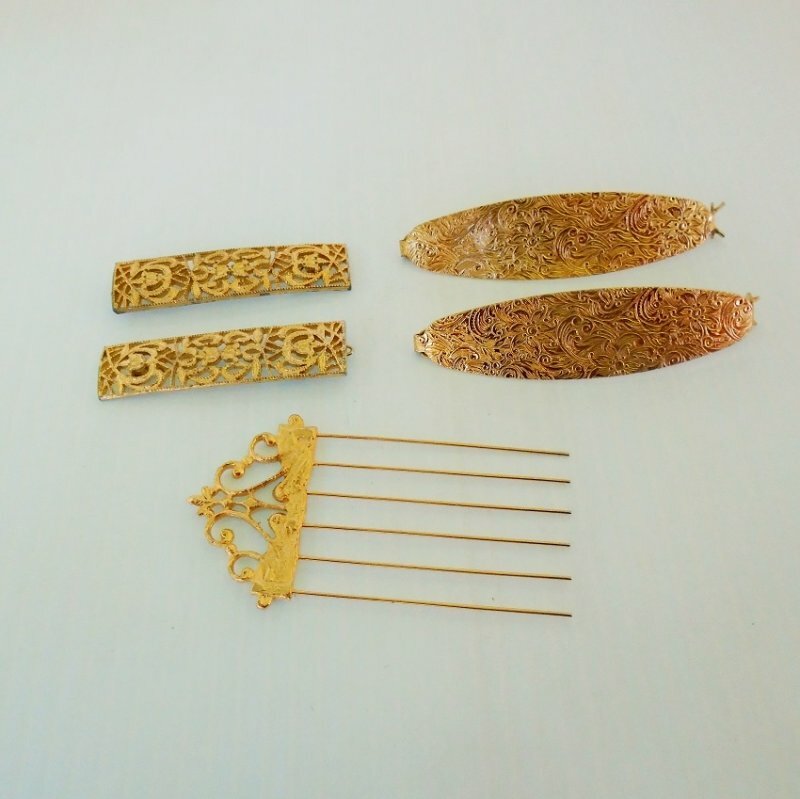 Estate sale collection of 4 goldtone hair clips and one comb/pick. Excellent condition. Stated to be 1950s to 1960s. At an estate sale recently, I purchased a small box of vintage hair clips. I have grouped them into 'themes" and will be posting several listings. All the hair clips are in wearable good condition. In fact, these 5 clips look as if they've never been used. The seller stated the clips were her grandmothers but the grandmother only fixed up her hair if she went somewhere important, like to church. The seller said she would think all clips would be from the 1950s to 1960s. She said her grandmother passed in 1972. There are no identifying markings on the clips. Delivery will be via USPS First Class Mail Parcel from Arizona. Buyer to pay delivery charges of $4.80. Every January the postal service increases shipping charges. This year they went a bit overboard and are now charging based not only on weight, but also on how far a package travels. I am in Arizona, so most of my packages travel eastward, and the further east it goes, the more the cost increases. This latest increase has added an additional .46 cents to up to one dollar on packages. I try to absorb some of the new charges but that's getting harder with each increase. Estate sale collection of 4 goldtone hair clips and one comb / pick. Excellent condition. Stated to be 1950s to 1960s.